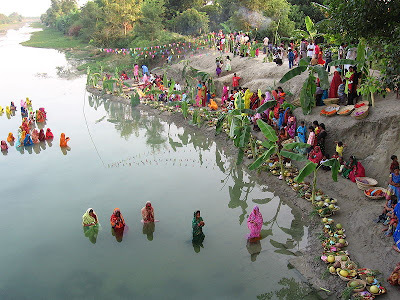 In Bihar, perhaps the biggest festival celebrated is the 'Chhath'. An ancient Hindu festival, celebrated on the sixth day after Diwali, Chhath is a sort of 'thanksgiving' to the Sun. Comprising of some really rigorous rituals, including a 'nirjala' vratt (a fast during which even water is not taken), Chhath brings practically the whole State to a standstill. Most of the labors and staff at shops and factories, and even all our house-help, go on leave for 4 days. People walk to the banks of the river Ganges, in the very early hours of dawn, to take a 'cleansing dip' in the 'Holy waters', and to offer their 'prashads' to the Sun God. I'm not exactly a Bihari, even though I live in Bihar currently. And we've never celebrated this festival. In fact, I didn't even know about it until 10 years ago, when my family shifted to Patna from Kanpur! Now for the last 3 days, there's been this loudspeaker going on and on in my area, playing some 'Chhath' special Bhojpuri song on repeat mode. From early morning, late into the night, I've been listening to this one single track, non-stop, for 3 days! And since I don't understand Bhojpuri, I have no clue as to what the lyrics of the song mean! But the tune is terribly depressing, like those 'Shehnais' playing in a typical Marwari wedding! So the 'Shehnais' have to sound mournful... they're symbolic of the 'vidai' of the bride from her parents' home, when she leaves her parents' home to join her new family with her in-laws. Not that I understand why this has to necessarily be an event for crying etc. I mean, it's not like she'd never get to see her parents again! And when she's starting such a beautiful new phase of her life, why see her off with tears in your eyes! No wonder people are so scared of marriage these days! Anyways, coming back to this music that I've been stuck with for 3 days... since I don't know much about 'Chhath', I'm not sure if the music is supposed to be like this. But, it started getting on my nerves by today morning! I got the feeling that somebody had died, that I'd come for a mourning or someone's 'vidai'! The atmosphere kept getting heavier and heavier with a sense of over-hanging gloom and despair, and I felt a growing urge to cry, though for no real reason! Finally, something snapped when I went to make lunch! I just screamed suddenly that I couldn't take this rotten music anymore! And that's when it all fell into place! Dad had been noticing my crankiness since morning. So he got up, closed the doors to both the balconies, to reduce the volume a bit, and then brought me my Sony Walkman and told me to plug it in my ears and play something happy. See now that's the reason why everyone should have a Dad. Sometimes, the solution just doesn't hit you! And having a Mom/Dad at that time helps. They usually are able to understand you better than most other people of the Universe, including you at times! So anyways, I played my list of fast English songs, and after a few songs, I stopped feeling that somebody had died. After another couple of songs, I started singing too, and eventually, I was able to snap out of that depressing mood, brought about by listening endlessly to a wrong musical 'raga'! There's a reason why 'morning ragas' must be played in the mornings, and the 'evening ragas' must be played in the evening. Music has a very strong effect on a person's mood. It can calm you when you are disturbed, but it can also disturb you when you were perfectly happy and content with life! And I honestly fail to see why the Hindu religion in India has now come to include a loud-speaker playing misfit songs during every major festival! This is my eleventh post for NaBloPoMo November 2010. Hmmm. People take a 'cleansing dip' in the 'Holy waters' of the Ganga. But who will cleanse the Ganga of all the filth... ??? Even I too fail to understand why loudspeakers have become indispensible with pujas. God is not known to be deaf. Or is it a ploy to make God deaf... ?? You are listening to better songs... trust moi. Here in BLR they play songs whose lyrics go like this: "Singapore hogi alli shopping madonna..." during Ganesh puja or some other puja. Imagine! Roshmi, yeah well that's why I put the words in quotes! :D They actually take soap & shampoo and stuff, and have a full fledged bath in the river! It's disgusting really! Oh yeah, we have those kind of lyrics too during Durga Puja, but the chhath songs were in Bhojpuri, so I couldn't make out the lyrics.